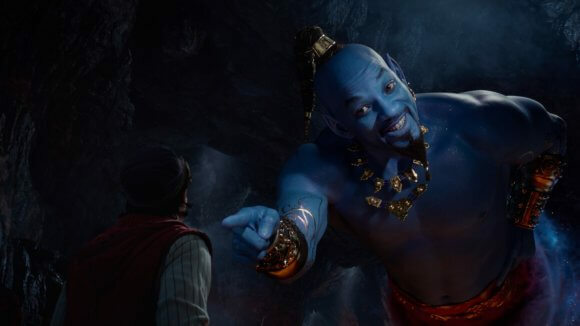 Disney’s first TV spot for the 2019 live-action version of Aladdin revealed the first real look at Will Smith as the Genie. The one-minute teaser features new footage from the much-anticipated live-action film, ending with Will Smith‘s Genie emerging from the magic lamp and introducing himself in all his blue glory. In addition to Will Smith, the cast includes Mena Massoud as Aladdin, Naomi Scott as Jasmine, Marwan Kenzari as Jafar, Navid Negahban as the Sultan, Nasim Pedrad as Dalia, Billy Magnussen as Prince Anders, and Numan Acar as Hakim. Guy Ritchie directed and wrote the script with John August, based on Disney’s classic animated film. Dan Lin (The LEGO Movie) and Jonathan Eirich (Deathnote) produced, with Marc Platt (La La Land) and Kevin De La Noy (The Dark Knight Rises) executive producing. Alan Menken, who won Oscars for the animated Aladdin’s “A Whole New World” and for the film’s score, wrote the score for the new version which will feature new recordings of the animated classic’s original songs he wrote with Oscar-winning lyricists Howard Ashman (Little Shop of Horrors) and Tim Rice (The Lion King). Menken teamed up with Oscar winners Benj Pasek and Justin Paul (La La Land) on the two new songs written specifically for the live-action film. The original animated classic opened in theaters 1992 and went on to pick up five Academy Award nominations, winning two. Ron Clements and John Musker co-directed the beloved animated film which featured the voices of Robin Williams as the Genie, Scott Weinger as Aladdin, Linda Larkin as Princess Jasmine, and Gilbert Gottfried as Iago. Disney will open Aladdin in theaters on May 24, 2019.